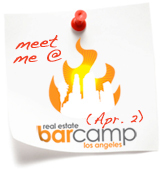 Join Us at RE Barcamp - Los Angeles - Aumnia, Inc. This Thursday, April 2, we will be attending the Los Angeles RE Barcamp at the Pasadena Hilton. Your first question must be – what is RE Barcamp??? Well, in short, it stands for Real Estate Barcamp, and it’s a free social media marketing event based on BarCamp.org principles. There is a great description of the event on the official RE Barcamp website. We will be there to continue learning about many of the new (at least to us) social media tools out there as well as share our thoughts about how mobile technologies can be applied to the real estate industry. It is a free event, and I expect it will be very information and a lot of fun from what previous participants have told me. If you haven’t signed up yet, it may not be too late. You can always RSVP, show up at the door, and hope they let you in! We are looking forward to see many of you there so we can catch up with our friends and continue to put faces behind the incredible people we have been meeting and following on-line! And don’t forget about the pre-event happy hour that Stacey coordinated to kick things off tomorrow! As far as the venue is concerned on Thursday, we’ve upgraded to a much larger space so we should still be able to accommodate folks. The more the merrier right?